Disclaimer: I received the product(s) mentioned below complimentary from the sponsor in return for my honest thoughts and opinions. All opinions are all my own and may differ from your own. Even though some sort of compensation may have been received, I only write about products that I have personally used and/or believe my readers will enjoy or benefit from. I am disclosing this in accordance with the Federal Trade Commission's 16 CFR, Part 255: "Guides Concerning the Use of Endorsements and Testimonials in Advertising." 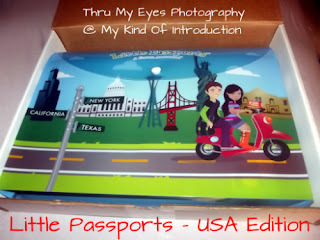 You may remember from a week or so ago mentioned in my previous Little Passports - World Edition Review, that I was receiving the USA Edition soon, in honor of the #BackToSchoolBlogParty. I am very happy to say - We have received the USA package and are having tons of fun playing with everything that came in the folder! I noticed right from the beginning that the USA edition was quiet different from the World Edition. First off - The 1st Month of the World Edition comes in a small suitcase while the USA Edition comes in a Heavy Duty Plastic Folder! Inside the folder was where all the wonderful goodies were found: a Map of the USA, State Field Journal, Disposable Camera, USA Scratch Book, and a Letter from Sofia and Sam. 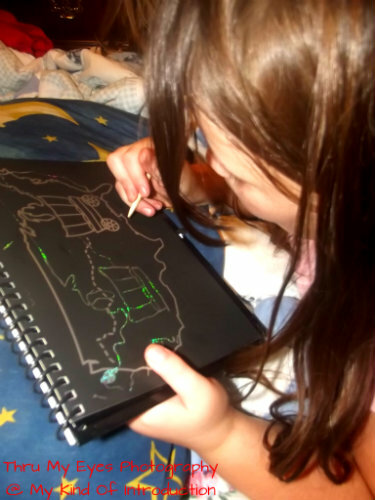 In the letter, Sofia tells us that they are going to travel to 2 states each month and will be sending us their State Field Journals, Stickers as well pop-out Puzzles for each state! 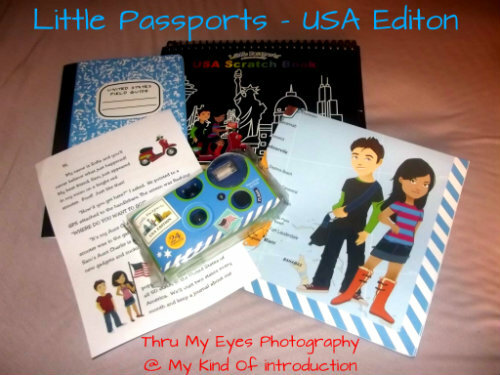 I was very happy to inform my daughters that we will also be receiving the next 2 months (September and October) of the Little Passports - USA Edition, so they will get to enjoy the gifts from 4 states that Sofia and Sam visit! In the Field Journal, the first few pages are made to fill out while your waiting on your next month! There is a Photo Scavenger Hunt.... The reason why we received a camera, where the girls get to take photos of their hometown to add to their journal. They also have questions where the answers can be found on their map! This is a real learning experience and the package couldn't of came at a better time. Learning Geography at their young ages of 6 and 7 is interesting to them and knowing that my daughters are not only having fun but learning as well, puts a HUGE smile on my face and makes me worry a little less about them heading to school in just a couple weeks. I'm going to have 2 smart little girls and I can't wait to see the teachers faces when they hear what all these little girls know about the USA! We even created a game that used the maps, field journals, Sproutkin books (from an upcoming review) their Word Wall Words (from their last school year), hop on one foot while saying the ABC's among many other little activities. Having the big maps and fun Summer Learning game! Loran and Jade can't wait until we receive September's package from Sofia and Sam! They are full of questions! "I wonder what states Sam and Sofia will visit! ", "What will the stickers have on them?" "Will we get a puzzle like Sofia said in the letter?" Their little brains are working overtime trying to guess the answers to all of their questions. No to mention all the fun they had with the USA Scratch Book! We're overjoyed with Little Passports! This is by far the coolest subscription program that I've been a part of! 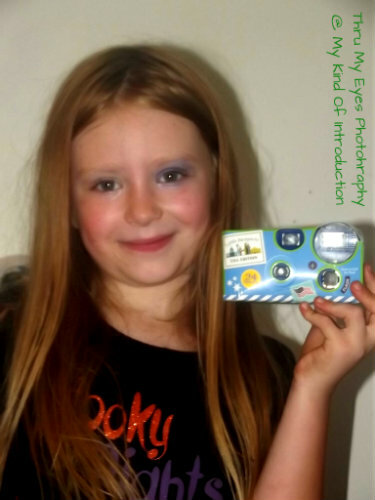 Little Passports gets an A+ from The Dancing Diva's and FaerieMommy aka Autumn from My Kind Of Introduction. We'll be doing a video review within the next couple weeks! And don't miss out on the awesome giveaway as well!!! To learn more about Little Passports visit them on the Little Passports website! You can find them on Twitter as well! Oh how fun! I can't wait to get ours! Your kids are going to LOVE it!!! That really looks like an awesome program - my girls would love it!